I recently had the pleasure of reviewing An English Renaissance published by Oboe Classics (CC2009). That excellent CD could perhaps be regarded as �Volume 1� of a series of releases concentrating on the contribution of English composers to chamber music featuring the oboe and strings. It introduced works by Moeran, Britten, Maconchy, Bliss and the unknown Dorothy Gow � who was actually my �big discovery�. The latest of these works was the Fantasy Quartet by E.J. Moeran which was completed in 1946. It is very easy to regard this showcase of playing by the late, great Janet Craxton as �Volume 2�. I accept that there is a chronological hiatus between 1946 and 1968, which was the date of the Quartet by Lennox Berkeley so perhaps this should be �Volume 3� with a future release covering works composed in the intervening two decades? Elizabeth Maconchy is represented by a work on both releases - by two very contrasting pieces indeed! I had to listen to the Oboe Quartet by Francis Routh three times before I could say that I actually enjoyed it and began to understand it. It reminded me yet again of two contradictory facts about music � firstly the listener�s need to invest time and effort in understanding a composer�s intention and secondly, has a composer a right to expect a listener to invest this effort? This is not the forum to resolve this dilemma, save to say that I am particularly pleased to have made the effort in this case. Routh said that he wanted to compose a virtuosic piece for Janet Craxton � �something that showed off her artistry�. The work was written in 1977 and had its first performance in Cologne at a British Council concert. It has the bearing of a concerto rather than a chamber work � the soloist is always prominent. The piece is conceived as a set of twelve variations with the theme being given in the introduction. However it falls into a loose three movement format with �traditional� �fast-slow-fast� tempo relationships. The �coda� nods back to the introduction giving the work a cyclic quality. In spite of the fact that Routh was experimenting with a �new� scale that had recently caught his imagination, the melodic quality of this Quartet is never in doubt. This is challenging music, both for the performer and for the listener � it is most certainly not the kind of piece to listen to in order to �chill� after a hard day at the office. However, the argument of the work is worthy and deserves perseverance. Elizabeth Maconchy is the only composer on this present CD who was also represented on An English Renaissance. Forty years separate the present Oboe Quartet from the Quintet for Oboe and Strings which was entered for the 1932 Daily Telegraph chamber music competition (the latter just reissued by Dutton in its original 1933 recording with Helen Gaskell and the Grillers on CDBP9762. Ed.) . There is a tremendous disparity in style. Certainly the Quartet owes a lot less to Vaughan Williams that her earlier work did! The Quartet lacks a declared programme, yet Maconchy�s daughter the composer Nicola LeFanu (also represented on this CD) has said that there is a close relationship between the composer�s 10th String Quartet, the monodrama Ariadne and the present work. Elizabeth Maconchy saw Janet Craxton as being a kind of Ariadne � deserted on Naxos by the feckless Theseus. This music displays the emotions of loss and anger of an abandoned woman. We are not told if this music is in any way autobiographical. The accompanying sleeve-notes give an excellent two page analysis so it is not really necessary to elaborate further! I will mention, however that this piece is in four well-balanced movements with the Scherzo placed second. The scherzo has been described as �playful� � but bearing in mind the legend that underlies this work that seems highly unlikely. My first thoughts were of a kind of suppressed aggression. But whatever the emotion the technical requirements are considerable. The �poco lento, dolento� is strange music. The text explains that this is the most obviously �Ariadne-like� music in the piece and further on that this is the most �integrated movement�. Perhaps some people hear music differently � but if I was pressed I would say that, in spite of the mournful playing � or perhaps because of it there is more meandering here than is good for it. Maconchy was always concerned that she should not become a fully paid up member of the �pastoral� school of English music: it is safe to say that this work steers well clear of that much pilloried cliché. I have already written at some length about Polemics by Richard Stoker and this is available on my WebPages about the composer. However it is worth making a few comments about the work for this review. Stoker was no stranger to writing for the oboe - in fact he produced An Oboe Method for the beginner. Furthermore his catalogue includes Chant & Danse for the Associated Board, Aubade, Three Pieces for solo instrumentalist and last but certainly not least a Pastoral for Oboe and Strings. The genesis of Polemics developed from his friendship with Janet Craxton. It was conceived really as a discussion or even argument between the composer and player. Of course the oboist was Janet and the other instruments were the composer! It is in three sections that could quite easily be seen or heard five. The composer explores various styles of music � including nods to Scarlatti and Mozart � however it is never derivative. It bears certain hallmarks of atonalism and perhaps even serialism � however the constructional principles certainly do not inhibit the composer�s invention. This is a piece that moves both the heart and the mind. The only downside is that this recording is in mono � for what reason I do not understand as stereo was well in use in 1971. Yet, although a new recording would be desirable, I doubt if it could completely replace the version recorded here. The close relationship between performer and composer would be hard to replicate. 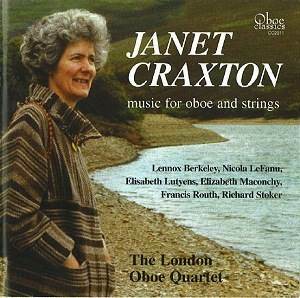 The Variations for Oboe Quartet is the only work in this CD that was not composed specifically for Janet Craxton. In fact Nicola LeFanu was asked by the Dutch oboist Victor Swillens for a chamber work after his success with an earlier Soliloquy for solo instrument. LeFanu wrote the piece in 1968 and subsequently it went on to win both the BBC Composer�s Prize and the Cobbett Prize. LeFanu writes in the booklet that this work is �not a strictly serial work� although the first oboe solo is a 12-tone melody. It is a very difficult work to describe in a few words but I suppose it is best said that it is very much a work of its time -1967. Some of the variations are extremely beautiful whereas others are perhaps more a result of the progress of the compositional technique. This is a fine example of a quasi-serial work that balances lyricism with the prevailing style of the times. The Lennox Berkeley Quartet for Oboe and String Trio is far and away my favourite piece on this CD. And perhaps this is not surprising. It is certainly the most traditional work and does not have a �programme� or rely on overt serialism. In fact the prevailing �building blocks� of this work are nothing more avant-garde than major and minor thirds. The work is in three movements. The first balances reflection with angst and is in traditional sonata form. Without the score it is quite difficult to come to terms with all that is happening in this intricate music. The Scherzo is by far the most exciting movement � lots of interesting writing here - with pizzicato strings and arpeggios for the oboe. The music eases off into a kind of trio before the movement finishes with a recap of the �presto� music. The last movement is the heart of the work � even if it is at the end! This is deeply thought-out material and is in complete contrast to the preceding scherzo. The music just kind of fades but with the last word being given to the cellist. The Quartet was commissioned by the Institute of Contemporary Arts and although it is not dedicated to Janet Craxton, she was certainly the soloist that Berkeley had in mind. He had already written an Oboe Sonatina for her and was to write a Sinfonia Concertante. It was to have been given its first performance by the Oromonte Trio, but unfortunately they folded before they could play it. It fell to the London Oboe Quartet to fill the breech and this is the version we hear on this CD. It was given at the Wigmore Hall on 22 May 1968. I must confess that I am not a great fan of the music of Elizabeth Lutyens. I was first introduced to her music at a performance of �O saisons, O Châteaux� (1946). Since then I have managed to avoid hearing very much by her. The present piece is the first that I have ever reviewed. �Driving out the Death� for Oboe and String Trio Op.81 appeals to me more than virtually everything else I have heard by this composer � with the exception of some film scores. Perhaps it is an inescapable fact that I do not relate to strict 12 tone works? Perhaps it is just misfortune in the nature of works presented to my musical palate. But this work appears to me to eschew some of the more rigorous excesses of the style. There appears to be a greater freedom and flexibility in her use of the material. This work is in fact quite listenable � even to those whose normal diet is not �serialism�. In fact it is a moving and interesting piece exploiting to the full the qualities of the oboe and the string trio. This strikes me as being much less hidebound by musical dogma than other Lutyens works I have heard. I notice that commentators use the work �lyrical� about this piece � presumably suggesting that somewhere amongst the workings of the tone rows there is a nice tune! Actually there are moments at which even the most conservative ear will recognise a truly memorable phrase. The work is based on a Greek ritual about the progress of the seasons where death and life are presented in mime. There are six sections to this fifteen minute work � really three groups of two. They are played without a noticeable break. This is the second CD production by Oboe Classics that I have reviewed - I hope to be listening to a third in the very near future. I must say that I am totally impressed by the quality of the production. For a start there is a 22 page booklet which has close written text about both works and performers. The works are described in great detail and allow a listener to have virtually a complete understanding of the �sitz in leben� of each piece. Furthermore there are two essays � one on Janet Craxton and the second a detailed discussion about the recordings themselves. The sound quality is generally excellent � bearing in mind that these recordings date from the nineteen-seventies - the Stoker is in mono! This in no way interferes with listening pleasure. Any glitches are deemed irrelevant when balanced against the quality of performance by soloist and the London Oboe Quartet. Basically this release includes five works (plus LeFanu) that were inspired by the playing of Janet Craxton � each of the players knew her personally and each composer was able to compose a work that exploited her unique talents. Some of these compositions may not be to everyone�s taste but - that notwithstanding - each of these works are at least minor masterpieces within a genre that is less represented than it deserves. All of these compositions display a great understanding of the technical abilities of players, instruments and chamber music in general.